‘Shoot all the bluejays you want, if you can hit ’em, but remember it’s a sin to kill a mockingbird‘. 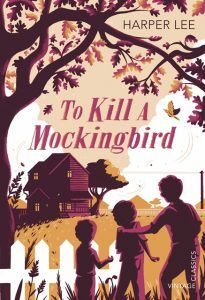 Atticus finch gives this advice to his children as he defends the real mockingbird of this classic novel – a black man charged with attacking a white girl. Through the eyes of Scout and Jem Finch, Lee explores the issues of race and class in the Deep South of the 1930s with compassion and humour. She also creates one of the great heroes of literature in their father, whose lone struggle for justice pricks the conscience of a town steeped in prejudice and hypocrisy. While this story seemed to lack the ‘punch’ of a modern story, there were quite a lot of pros for this book. We enjoyed the overall simplicity of the writing, the simple setting and the quiet strength of the main characters. We’d all wished we had a father like Atticus. We can also see the impact this book would have had when it was first released and understand completely why it is studied in schools. While we have come a long way, the subject matter is still very much relevant today. For some of our readers, it did lack the ‘pace’ of today’s stories. Overall though, we rated this book a commendable 7! This is definitely a book that everyone should read it at least once. This entry was posted in Awards & Prize Lists, Book Club Kits, Book Reviews, Classic Literature, Fiction, Recommended Reading by Parra Reader. Bookmark the permalink.